Seeking a satisfying career in BIG (Business, Industry and Government) is a multi-stage process. You start by identifying your goals and personal values. Then you plan what courses to study, craft a great résumé, and try out an internship. You learn more about career options, and research and apply for full-time jobs. You interview with confidence because you know the job matches your skills and values. After getting the position, you develop a network of mentors, and continue to grow your career. The BIG Jobs Guide takes you step-by-step through these stages, and includes practical checklists and advice from mathematical scientists in industry. We recommend investing in a copy of the BIG Jobs Guide. Following are some online resources that help you get started, and complement the material in the BIG Jobs Guide. The online resources are broadly aimed at college students. 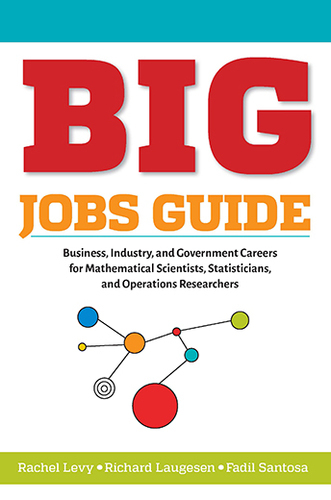 For specific guidance for mathematics, statistics and operations research majors, you can consult the BIG Jobs Guide. If you are an undergraduate student, you have or will have taken required courses for your major. Beyond those, we suggest taking courses in other departments, for example, computer science, engineering, business, and economics. These will be helpful to connect your mathematical sciences knowledge with applications. For graduate students, we also suggest taking advanced undergraduate level or graduate level courses in other disciplines. Some are free and others require payment; some lead to certification while others do not. Read the reviews and be an informed “consumer”. The career office at your institution should be able to help you prepare a professional-looking resume. You can also jump start the process by reading material provided at this site. Do I really need to do an internship? Yes! Read the articles at the BIG Math Network! Visit your campus career office for an individual consultation. Go to career fairs at your home institution and at your town. Make a Github site for your code samples. Connect with alumni from your program. Ask the director of your undergraduate or graduate program for suggestions of whom to contact. Ask your friends, family, and neighbors. Tell mentors you are interested in BIG careers, and see what connections and advice they can offer.